My friend Marah was in town for business, so it gave me the opportunity to go into Minneapolis for a great “foodie” dinner! I used to have foodie dinners in Chicago on a regular basis and obviously had amazing meals in Italy all the time. Since we have moved back to Minnesota, I have yet to get out for a unique and amazing meal. Marah and I both love to cook and we appreciate both regional home-cooking as well as chef-prepared “foodie” dinners. I decided Haute Dish was the perfect restaurant to try. 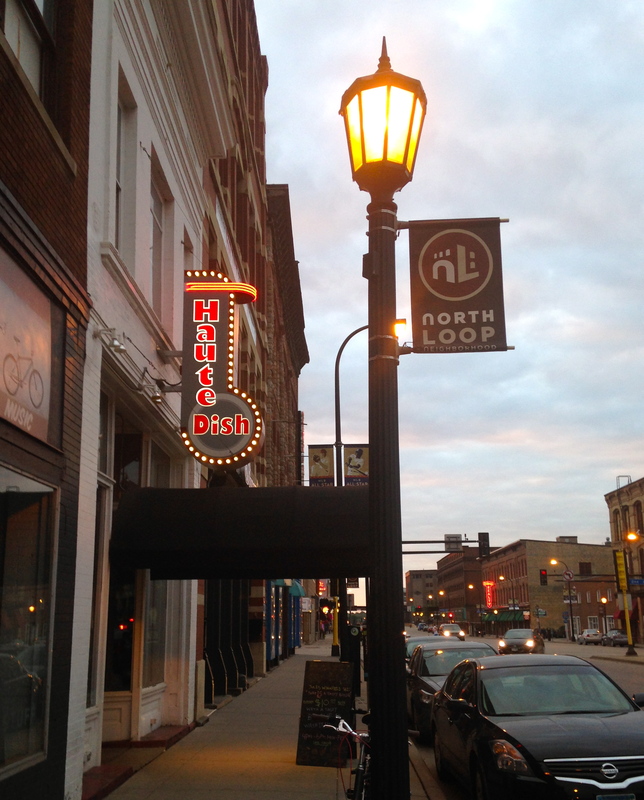 The name is a play on the Minnesota comfort food of hotdish and the menu seemed to take both aspects of the food we love and combine them. I had been wanting to try this restaurant for awhile and when I explained the concept to Marah, she loved it. The restaurant only offers a few tasting menus, so we decided to try two of the smaller tastings and split them. The first was the “HD Classic” and consisted of three courses: house salad, mac n cheese and tater tot hautedish. The other was “Meatless Monday” and consisted of four courses: green goddess salad, fried green tomato, green eggs and parm, and “choose your own adventure” for dessert. It was quite dim in the restaurant and I only had my iPhone for a camera, so I admit these are not the greatest pictures of the food. But I feel they are enough to capture the idea of what we enjoyed. 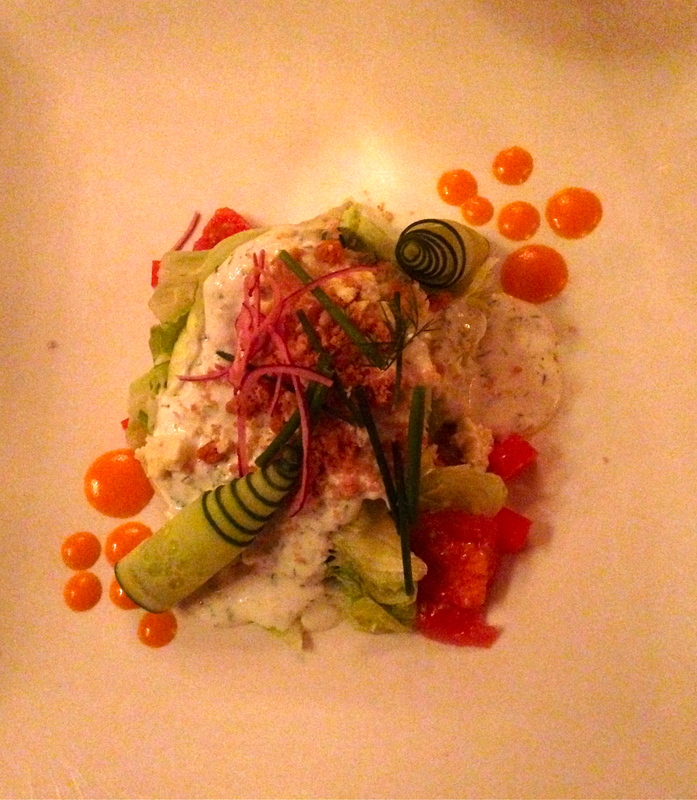 The first course of the HD Classic menu was “house salad.” It was a wedge of iceberg topped with bacon, blue cheese, tomatoes and cucumbers and served with french and ranch dressing. I absolutely love that this is the traditional midwestern salad I have grown up with, but obviously elevated. The presentation was beautiful, all of the components were very fresh and delicious and the ranch tasted of fresh herbs. It was a great start to the meal. The second salad was the green goddess salad. 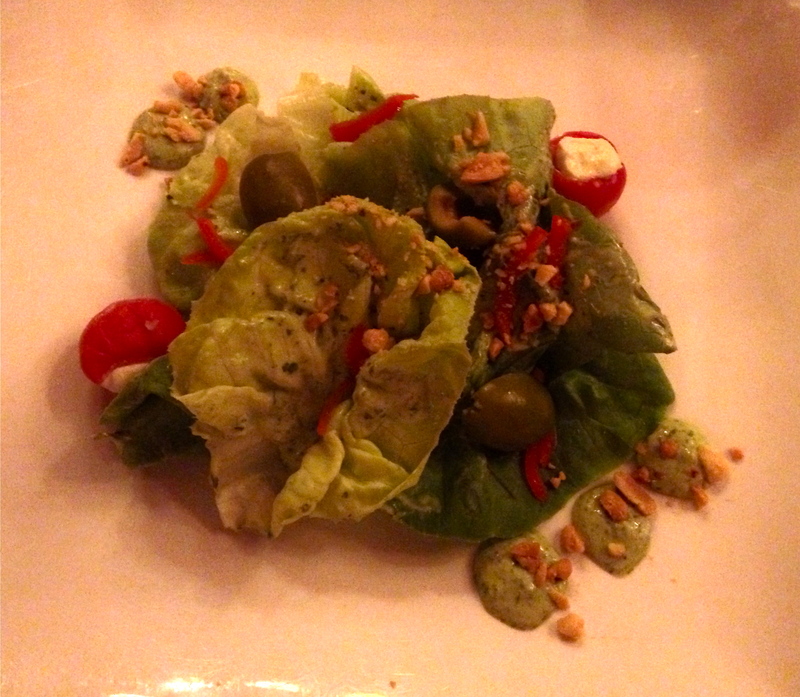 It was bibb lettuce served with a green goddess dressing topped with toasted peanuts, cheese stuffed peppadew peppers and green olives. 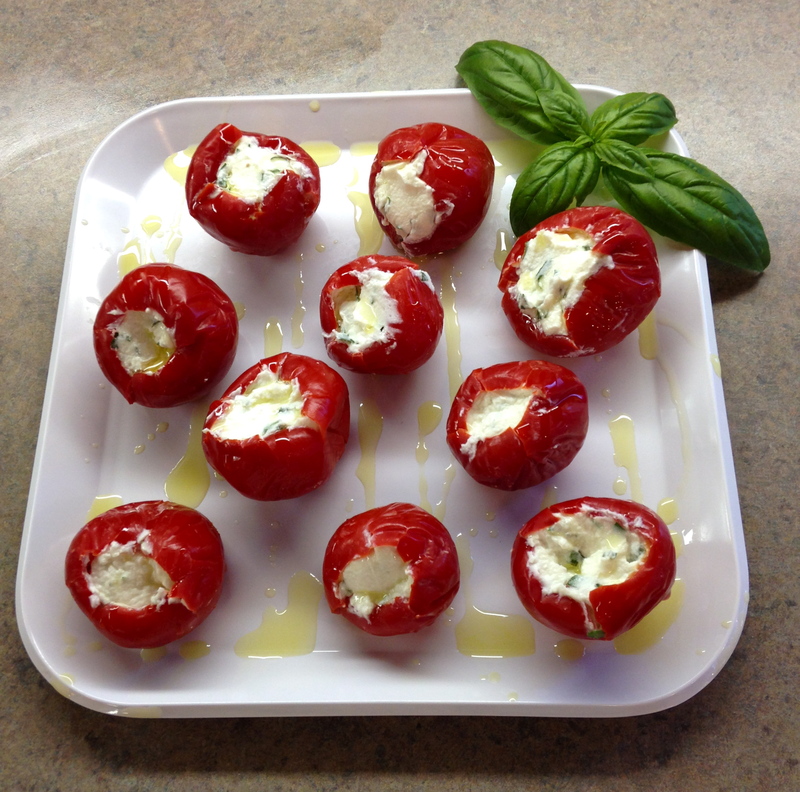 The flavors were bright and I absolutely love cheese stuffed peppers (I have my own recipe on this site under antipasti or at http://italianmidwestern.com/recipes/antipasto/stuffed-cherry-peppers/). This salad was very enjoyable, but not quite as outstanding as the house salad. Our second courses were the best courses overall. For the classic menu, we were served macaroni and cheese with crab meat that had an extremely creamy cheese sauce that included tallegio cheese, one of my favorites that I ate a LOT while in Italy! It was topped with tobiko (flying fish roe), fresh parsley and celery leaves. This was so decadent and amazing. It is a very good thing this course was portion controlled, because I would have had a very hard time stopping myself if I was presented with a much larger plate-full! The meatless Monday menu’s second course was fried green tomatoes. 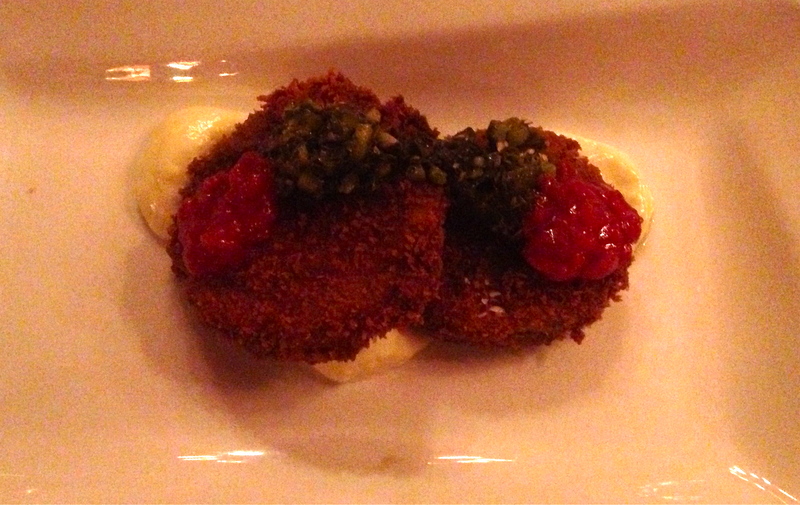 These were served with a fingerling puree and a roasted tomatillo chimichurri. The tomatoes were perfectly fried to a tender, but firm texture with a crispy outer coating. The fingerling puree added richness and the chimichurri brought a brightness that cut through the heaviness of the dish. It was so delicious! I have to say we didn’t love the main courses. We certainly didn’t hate them either, but we were not blown away by these dishes. 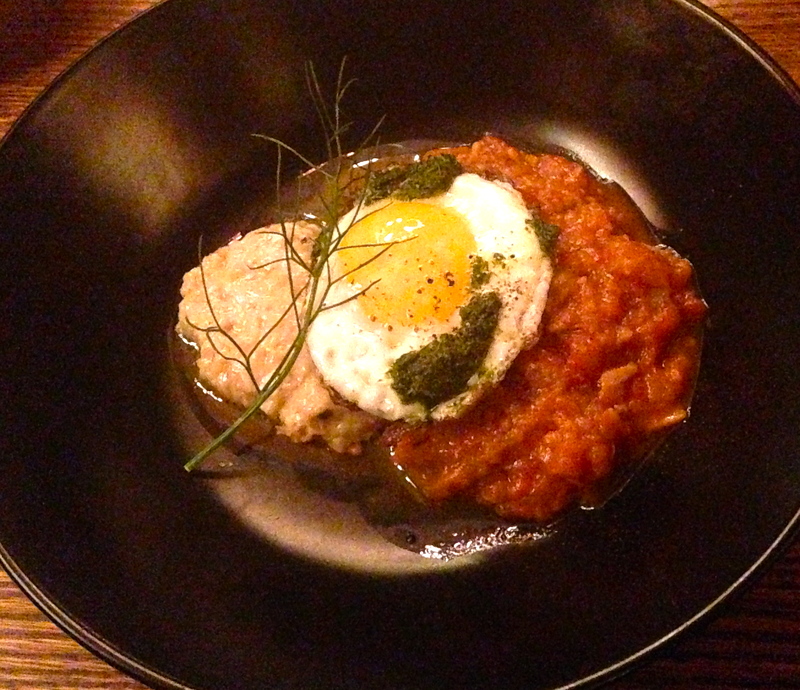 The classic menu’s tater tot hautedish was my most anticipated dish of the night. This was a deconstructed version of the traditional Minnesota dish. It was braised beef, homemade tater tots (which had the consistency of mashed potatoes that were formed into a tater tot shape and then fried), green beans, mushrooms, gravy and jus from the beef. Then the dish was topped with a little cheese. Overall this dish was very good, it was just over-salted. I think the braised beef and the jus were the culprits. My guess is the sauce over-thickened and the saltiness became too intense. If the saltiness were better balanced, this dish would have been excellent! The main course for the meatless Monday menu was green eggs and parm. This was my least favorite dish of the meal. It was a parmesan steak, for lack of a better term, served with an heirloom tomato sauce, a fried egg, and a fennel garnish. I like the idea of what they tried to do with the parmesan, but I didn’t love the texture of the “steak”. And unfortunately none of the other components of the dish wowed me either. To finish the meal, we split a dessert. 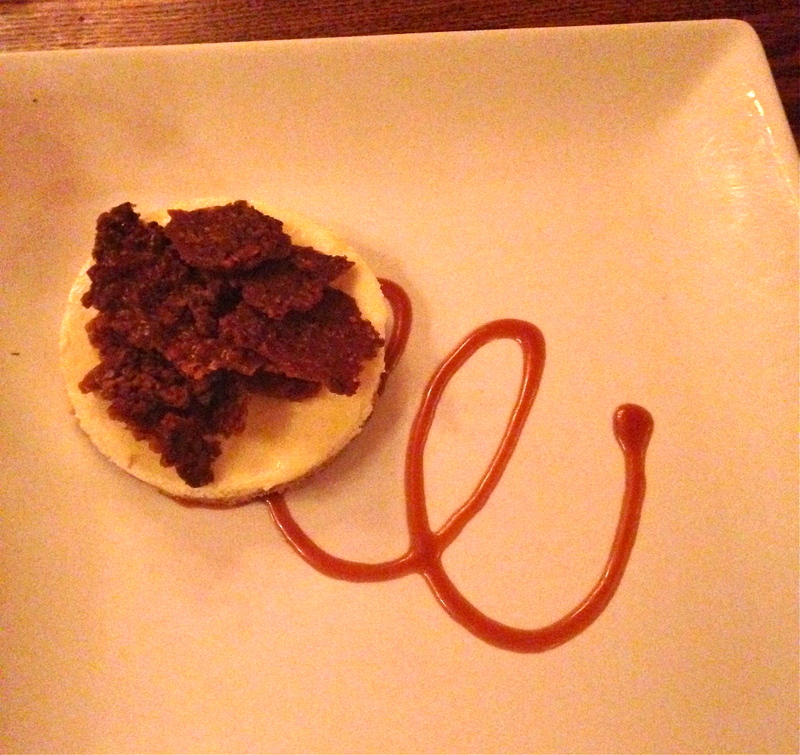 We chose the cheesecake that was topped with a brittle and served with a bourbon caramel sauce. This dessert was excellent and plenty to share! It was a great mix of textures and was decadent, but not overly sweet. It was a fabulous end to the meal. 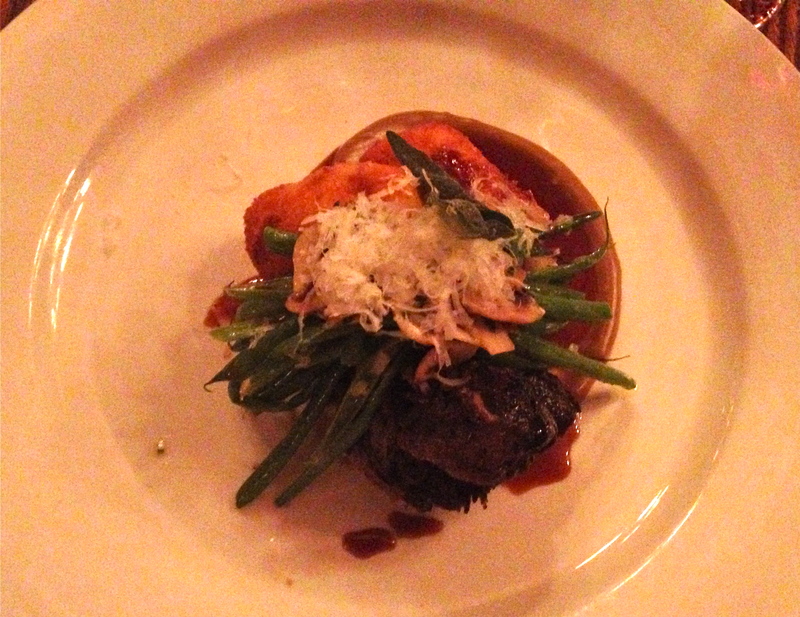 Overall, I loved our dinner at Hautedish and continue to love the concept of this restaurant! This was the perfect choice for my first “foodie” dinner out since our return to Minneapolis. If you are a close friend or family member of mine and you offer me help in a time of need, there’s a good chance your thank you will come in the form of food. My soon-to-be sister-in-law Lindsay loaned me her car for four days so that Emily and I weren’t without a car while Joe made a trip to Chicago to tend to our condo. Joe didn’t get home until late on the evening that Lindsay needed her car back, so my brother drove her up to get it on a Tuesday after work. Since they were coming at dinner time, I figured cooking them dinner would be a great way to say thank you and to hopefully make the trip up to our place feel a little more worth-while. 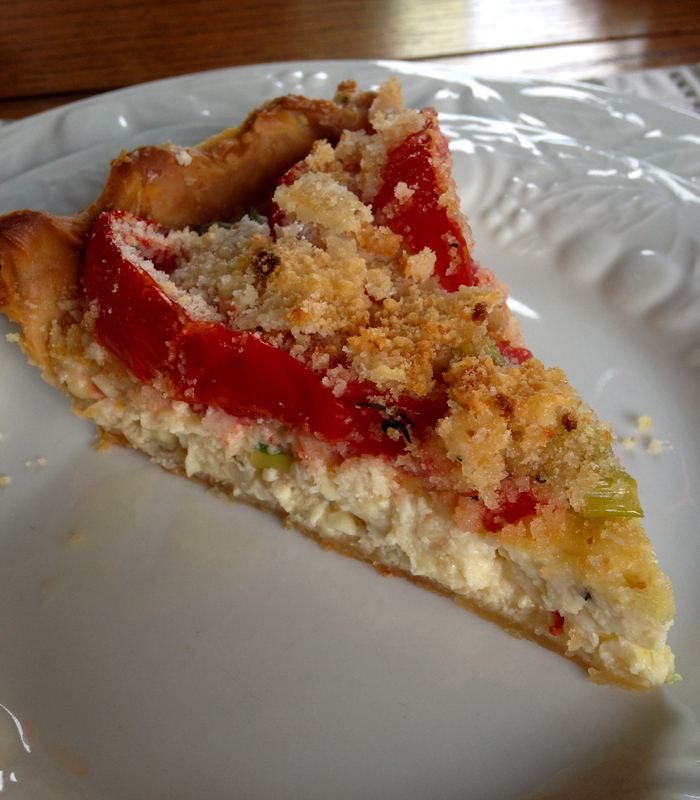 For the primi piatti, I made a tomato and corn custard pie. I found this recipe in the September 2014 issue of the Food Network Magazine. To be honest, I used needing to thank Lindsay for using her car as an excuse to make this pie. It was SO GOOD. I bought fresh sweet corn and an amazing (and huge) tomato from a local farm stand. The quality of corn and tomatoes used makes all the difference in this recipe and it is certainly no coincidence this recipe was in the September issue of this magazine since this is the best time of year for corn and tomatoes. I will likely find a reason to make this pie at the end of every summer. 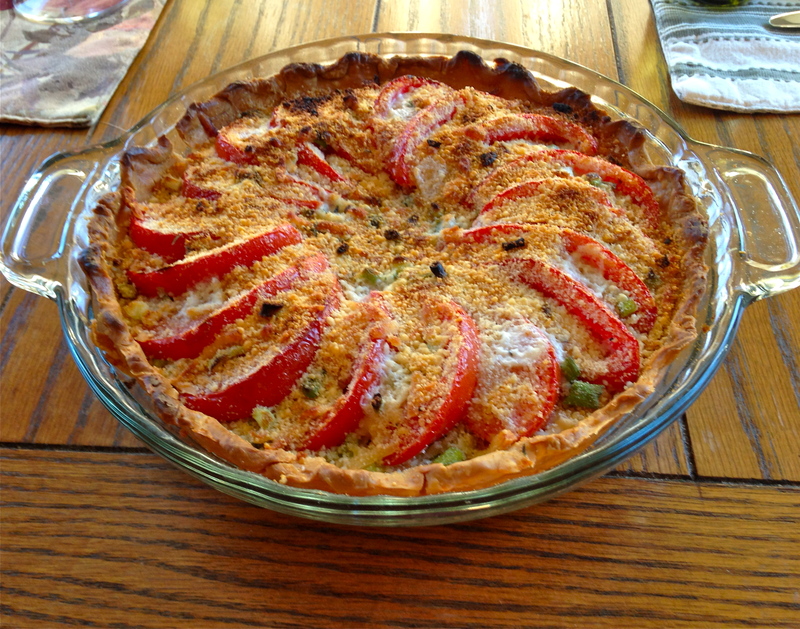 It was so creamy and decadent but also really highlighted the flavors of the corn and tomatoes. It was so good! Lastly, I served my own version of tagliata di manza (strips of beef) as the secondi piatti. I fired up the big green egg and grilled a flank steak that I had marinaded in olive oil, salt, pepper and chopped rosemary. 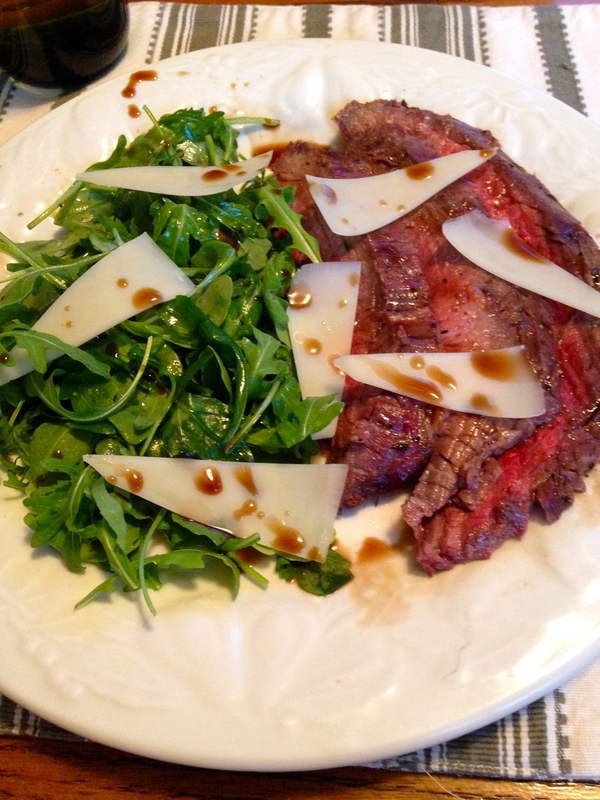 I served it as we experienced in Italy, with an arugula salad, shaved parmesan and a drizzle of balsamic vinegar. Such a simple and delicious dish! 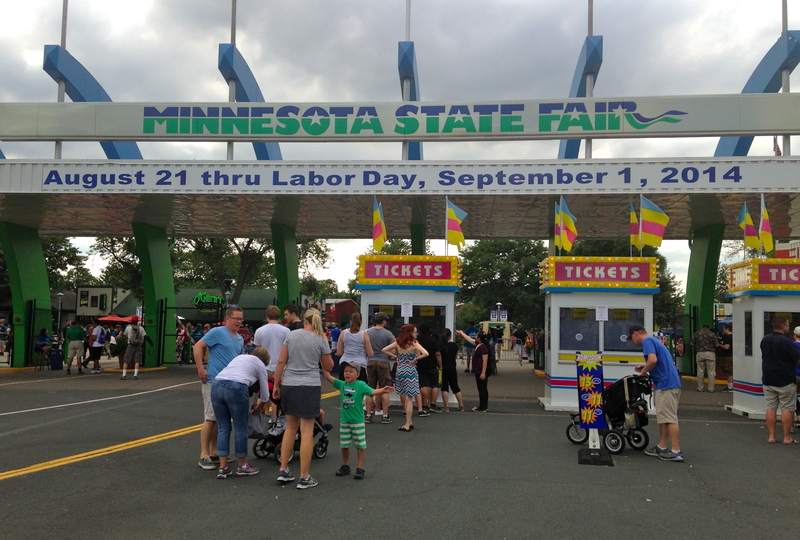 I am so excited to be a resident of Minnesota again during the state fair! I have certainly made trips back for it during the 9 years I lived in Chicago, but there’s just something about living here and hearing the constant buzz about the fair on radio and TV stations. It’s hard to have a conversation with anyone during this time where the fair does not come up in some way. And it was Emily’s first state fair ever! We had so much fun. 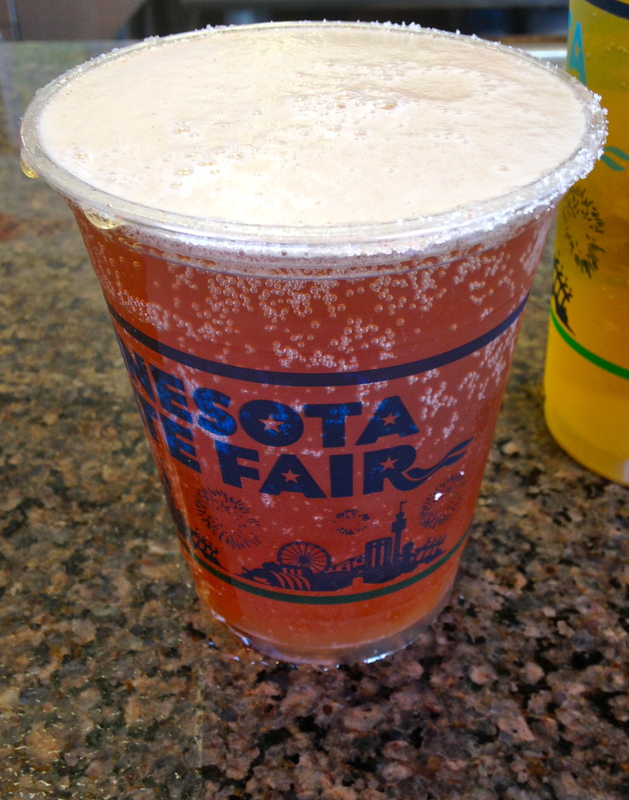 There is certainly more to do than just eat at the MN state fair. We saw a ton of animals, which Emily LOVED. She and Joe also road the giant slide, which she didn’t love. 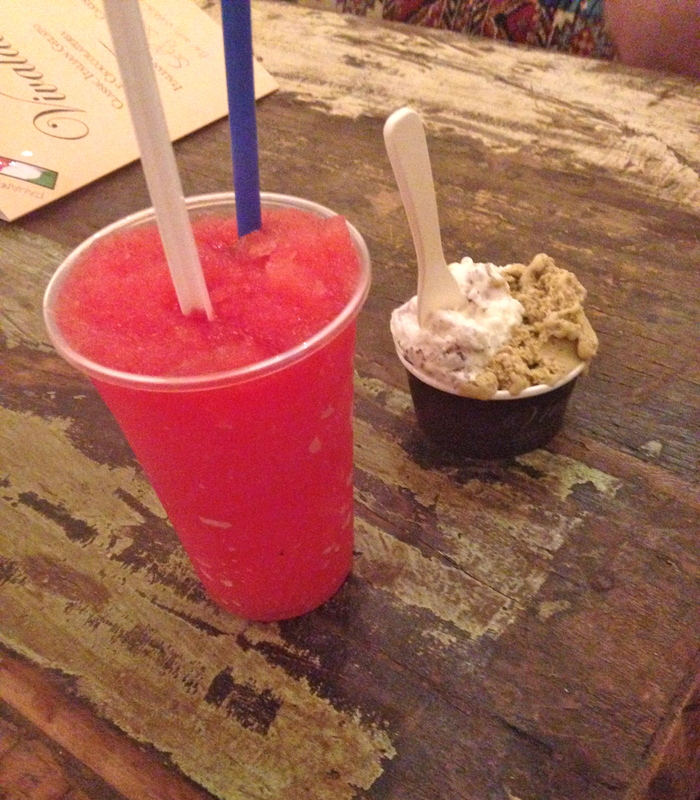 But sights, rides, and shopping aside, the food always steals the show. We were lucky to be able to go to the fair with two good friends and their toddler, so Emily had company and we had more people to share food with. This is my #1 strategy if visiting the state fair: go with as big of a group as possible so you can try a larger variety of food! Obviously the group should consist of people you feel comfortable sharing food with. The very first thing we got was corn. 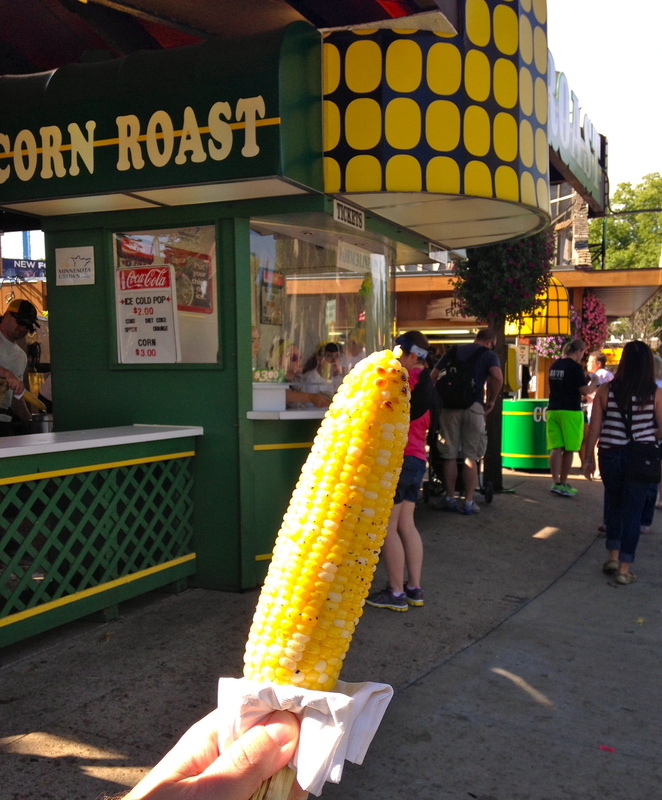 It is one of the few items at the fair that is not deep fried, but they make up for it by dunking the entire ear of corn in a huge vat of melted butter. 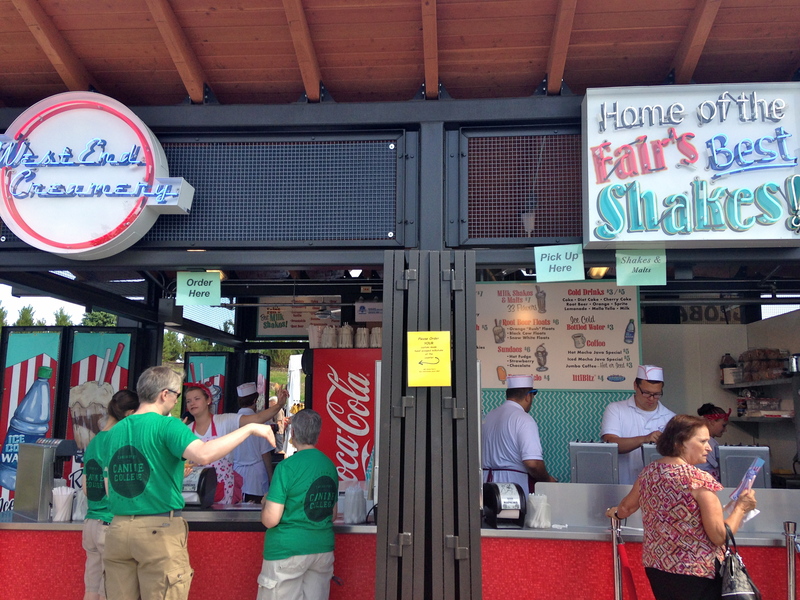 It is truly perfection and a fair staple that we get every time we visit the fair. The next stop was a spontaneous decision by me and was something I have never tried. 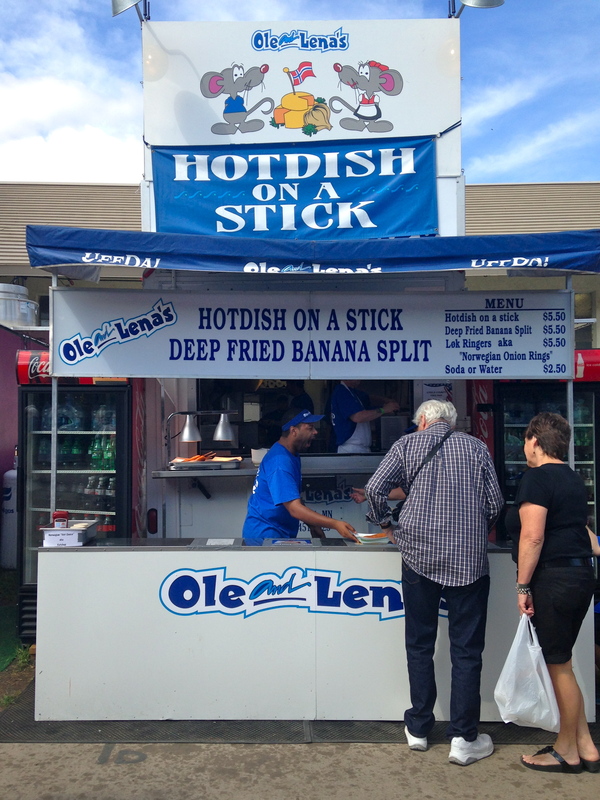 But I don’t know if you can possibly get more Minnesotan that hotdish on a stick from Ole & Lena’s stand. I decided to give it a try. Ole and Lena did a take on tater tot hot dish by skewering meatballs and tater tots on a stick, dipping it in what tasted like corn dog batter, frying it, and serving it with a side of sausage gravy. I would recommend this dish to someone who likes the idea of corn dogs (or pronto pups as they are called at the fair), but isn’t a big fan of hot dogs. I really love the idea of this one and it was tasty, but not outstanding. The meatball bites were delicious, but the tater tot bites were just mushy and heavy. 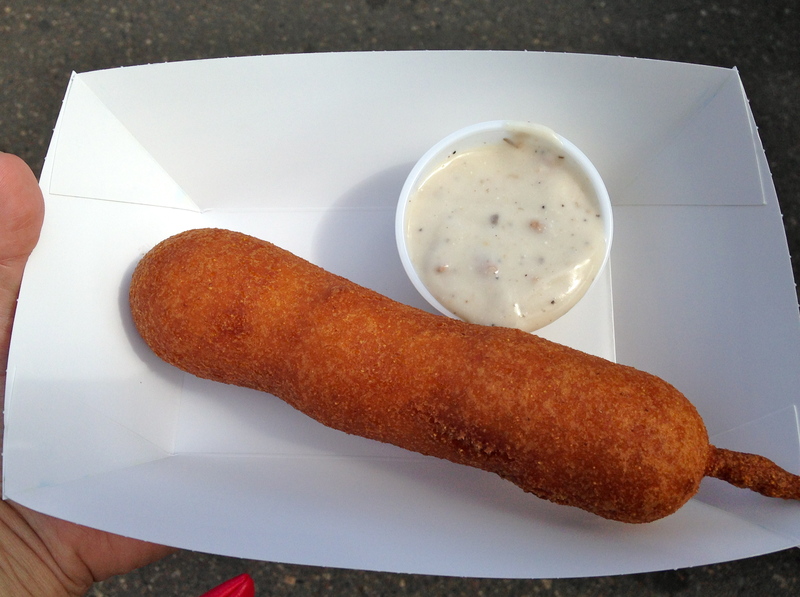 I think corn dog batter needs meat to stand up to it. Next we made our way to a new part of the fair, the West End Market. 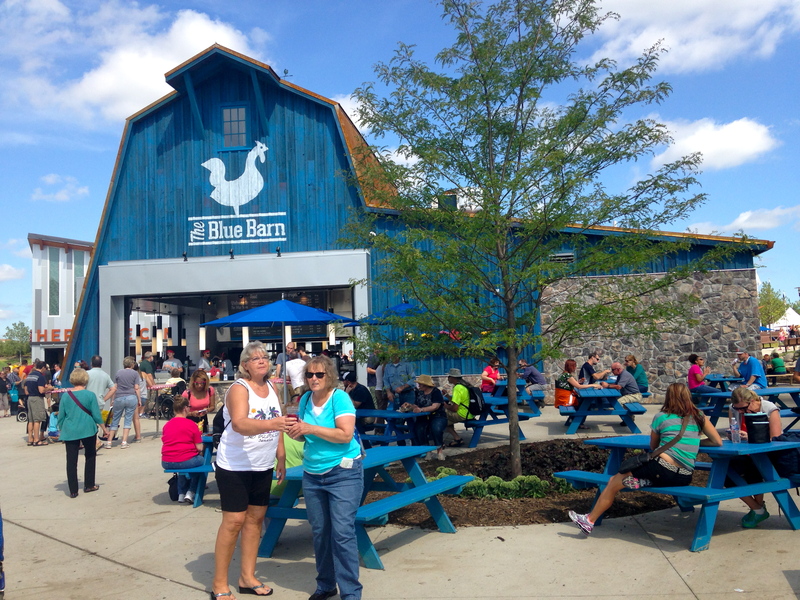 I had seen and heard a lot of buzz about the Blue Barn, which seemed to be doing some interesting “foodie” state fair food, so I had to check it out. 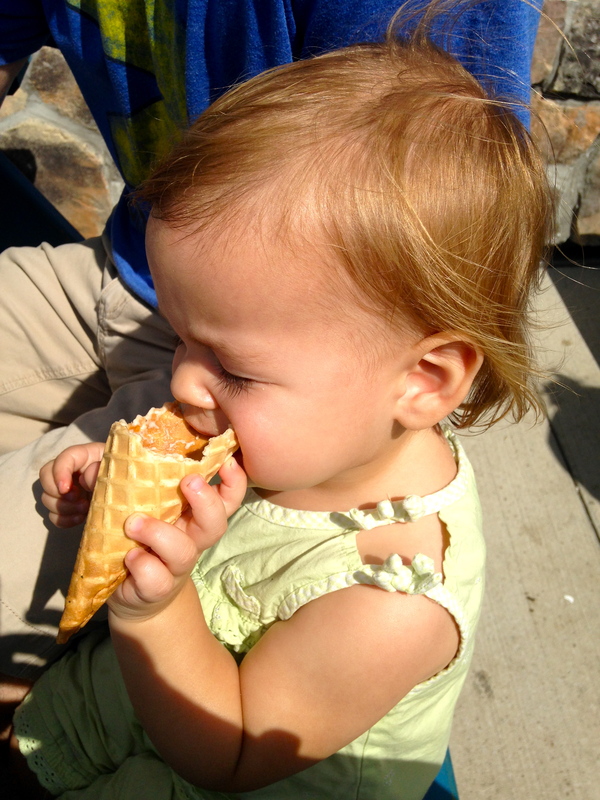 First we tried chicken in a waffle cone. This was the dish I was most excited to try and I really wanted to love it. I wish I could say I did love it, but I would say it was just good. 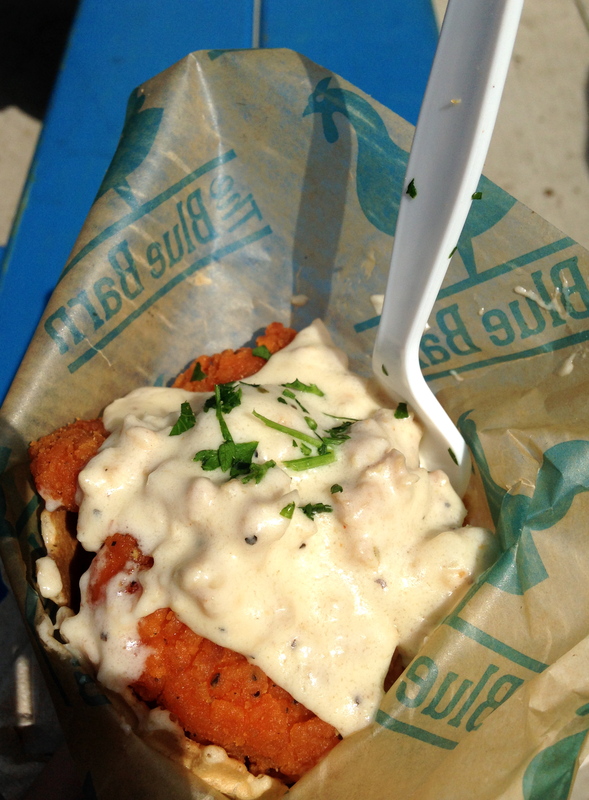 It was basically small pieces of fried, boneless chicken with a spicy coating, covered in sausage gravy, served in a waffle cone. The presentation was very clever, but the issue with serving it this way is that it was difficult to get a true bite of the whole dish, so it didn’t really come together for me. I would just eat a bite of spicy chicken with gravy and then an occasional bite of waffle cone. I also think I would have chosen a different sauce for the chicken such as a maple syrup-based sweet sauce to offset the spiciness of the chicken. The gravy got kind of lost in the dish. Hopefully they will build off of this year’s experience and improve the dish for next year. 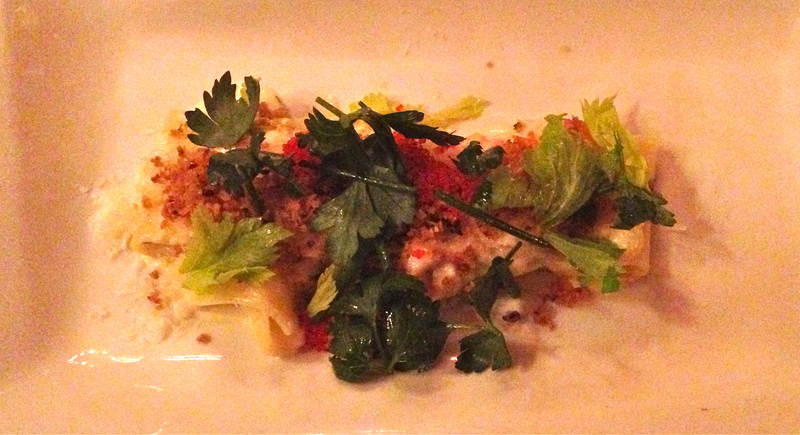 The other dish we had at the Blue Barn was my favorite of all the new food we tried this year. 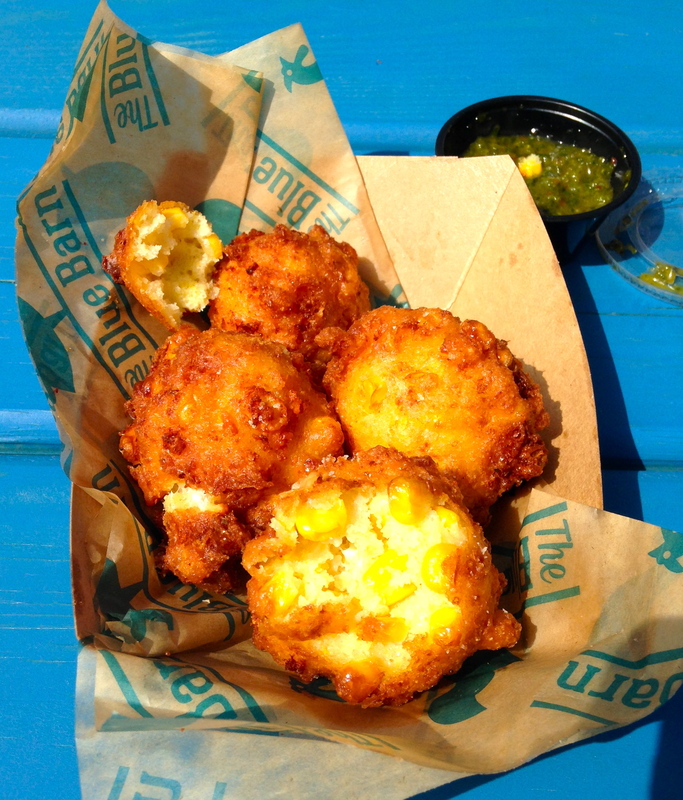 And I plan to get it again next year if it returns: blue cheese corn fritters. The blue cheese was quite mild and the corn was really sweet. Not only did the adults love this dish, but the toddlers did too! The fritters were served with a chimichurri sauce that was bright and fresh and cut through the the heaviness of the fritter. And although I did like the chimichurri sauce, I also thought they could have taken this dish one step further from an indulgent perspective (since it’s the fair and we’re not here to eat light) and make some sort of a creamy blue cheese dipping sauce to drive home that flavor. Maybe next year they could serve the dish with two sauces and let the consumer decide which route they would like to go. While at the Blue Barn, I heard several people talking about the West End Creamery. It was a sunny day and it was starting to get a little warm, so we decided it was a good time for the kids to get some ice cream. 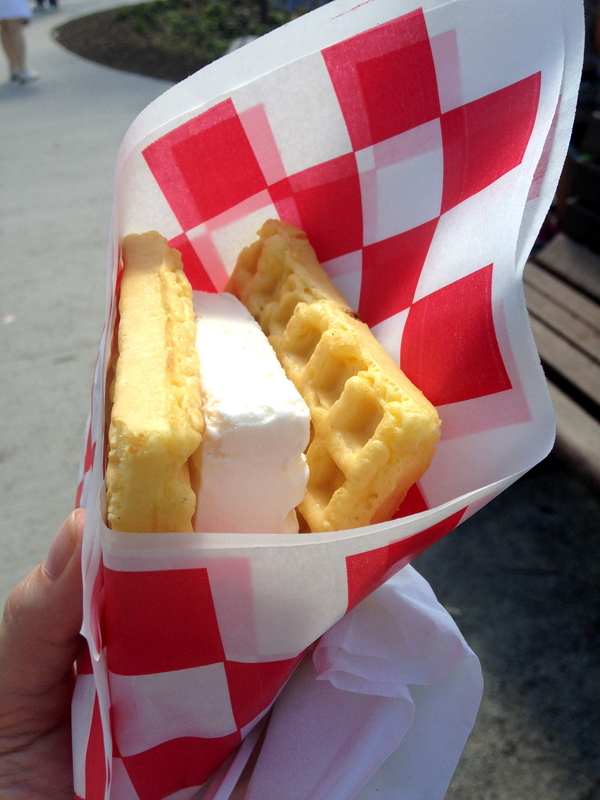 We decided to try another new food item to the fair this year, the hot waffle ice cream sandwich. They literally wait until you are at the counter ready to pick up your sandwich before they toast the waffle so that you’re sure to get a hot waffle, but not a melty mess. This was another dish that I really wanted to love, but it was just missing something. I actually think it was missing a bit of salt. 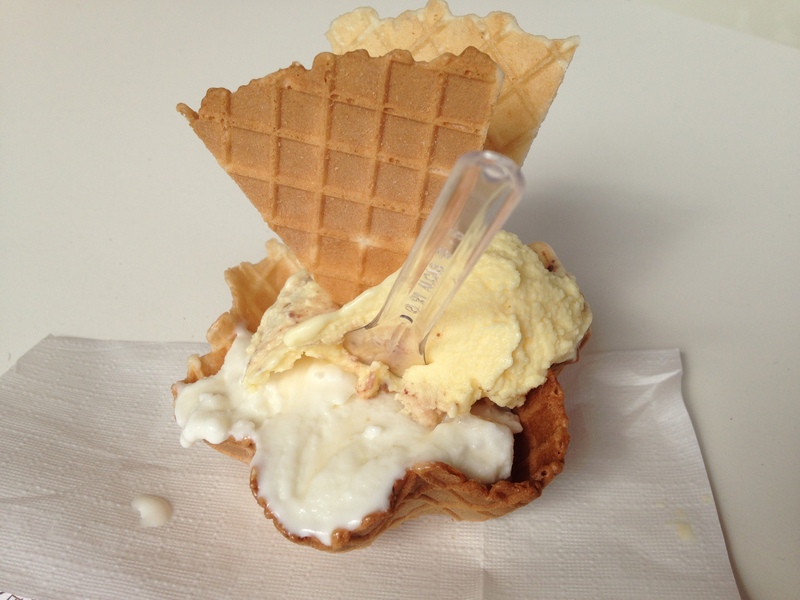 The ice cream was good and the waffle was okay, but the whole dish just tasted really plain. If there was a way to incorporate some chocolate or caramel with a bit of sea salt, that would have made the dish unbelievable. But Emily loves ice cream in any form, so this wasn’t a complete miss. By this point it was the afternoon, and the adults were ready for a drink. We went in search of the last state fair item I had heard of but hadn’t tried that I really wanted to find this year: mini donut beer. I definitely wasn’t sure if I would like it, but knew I had to give it a try. To drive home the mini donut flavor of the beer, they rim the glass with cinnamon sugar. This beer was quite enjoyable! It had a mild, malty flavor and the cinnamon sugar was strangely addicting. Although I wouldn’t necessarily choose to drink this beer on a regular basis, it did a great job of capturing the essence of the state fair in a glass. And honestly, I kind of wish we would have gotten mini donuts with it to dunk in the beer. I’m guessing it would have been amazing. Maybe next year. Our next stop was the perfect beverage for Emily to enjoy: milk. And I will state right now that the best way to visit the milk stand at the MN state fair is with a bucket of Sweet Martha’s cookies. I’m sad to say that we didn’t get any cookies this year. I really didn’t want to bring any of the state fair home with us (it’s such an indulgent day, I don’t like the indulgence to carry over into my every day life) and even the cone of cookies is so huge. And I can’t bring myself to throw away what we don’t eat because they are so good. 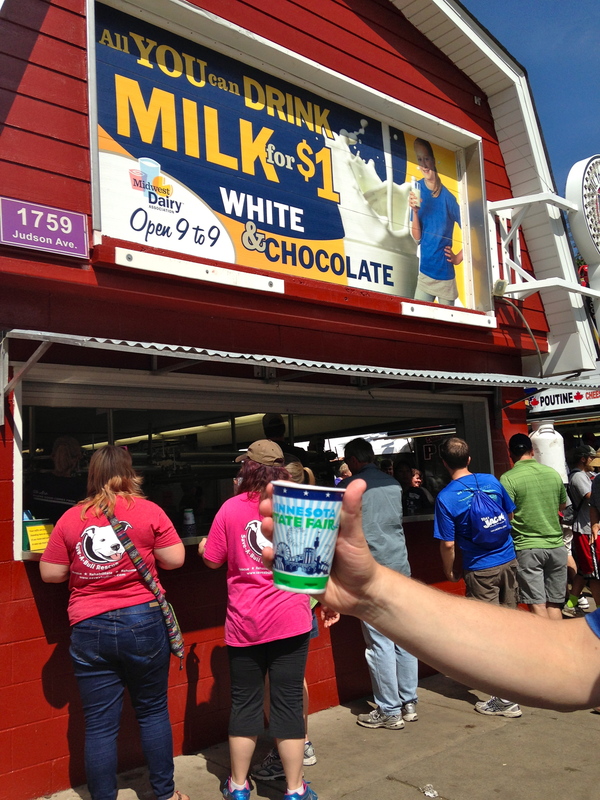 But Sweet Martha’s cookies with the all you can drink milk is a state fair staple for sure. This year we just got the glass of milk for Emily. To end the day, we found a table in the Garden and enjoyed some live karaoke. We decided we had room for one more snack to share before we headed home. So we got cheese curds! 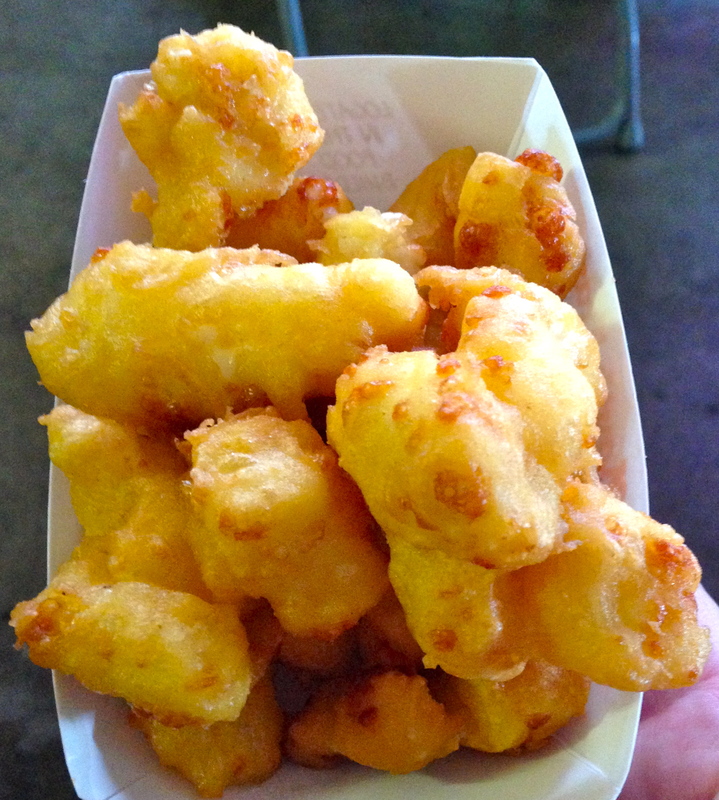 These are the best cheese curds I have ever had. And they are consistent every year. If I were recommending food to a person who was attending the fair for the first time, the three things I think a person has to try are the cheese curds, roasted corn and Sweet Martha’s cookies. That sums up the Minnesota state fair to me. It was such a fun day and an event I look forward to every year. And it was so much fun this year seeing Emily experience it for the first time! She absolutely loved the animals, had fun playing on the tractors, and was enchanted by everything there was to see around her. And she enjoyed some good food as well! Last weekend I was lucky enough to take my first cooking class in Minneapolis! The class was a part of the bachelorette party festivities for my future sister-in-law, Lindsay. It was so much fun! 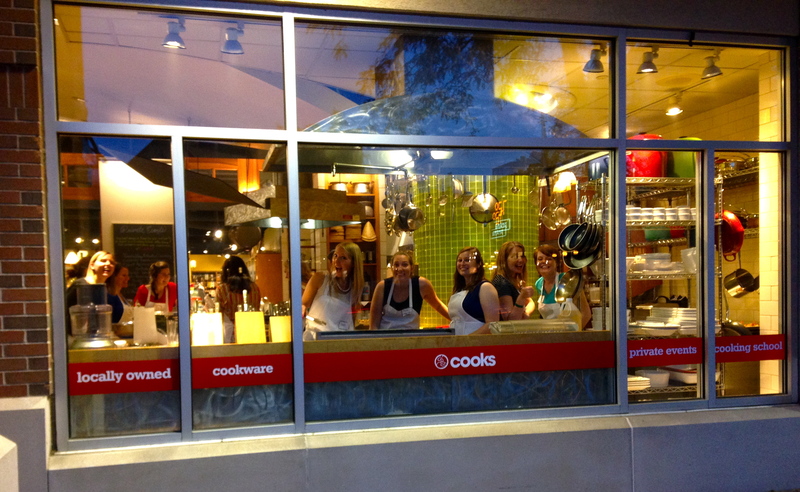 There was a group of about 15 of us and we took a private class at Cooks of Crocus Hill in Edina. We were divided into groups of 3-4 people and assigned to one of four stations. Although I didn’t necessarily learn anything ground-breaking in this class, I walked away with four delicious new recipes and had a great time! Cooks of Crocus Hill did a great job setting up the event for a fun social occasion and accounting for a group of people with varying levels of cooking experience. I was assigned to the salad station. 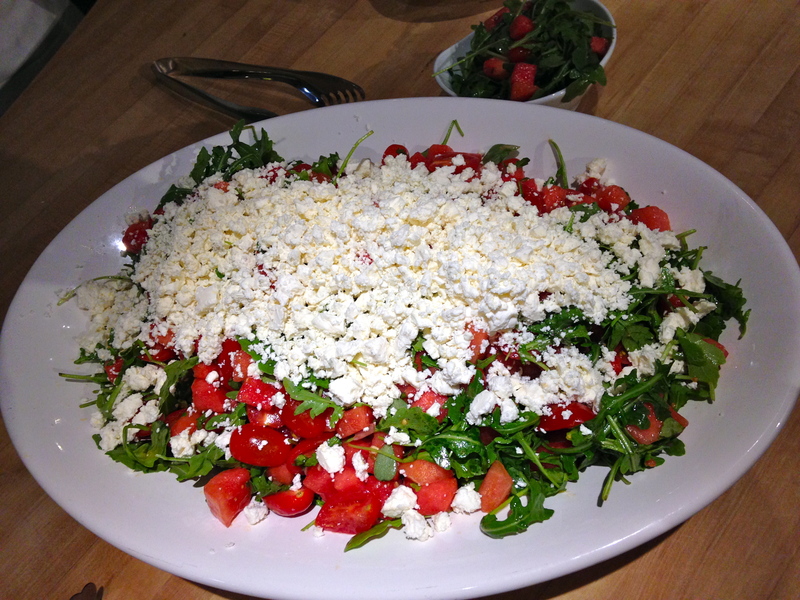 We made a delicious arugula, tomato, watermelon and feta salad dressed with a serrano chile vinaigrette. If you’ve never tried watermelon and feta together, it is a fabulous combination. This is such a great summer salad! 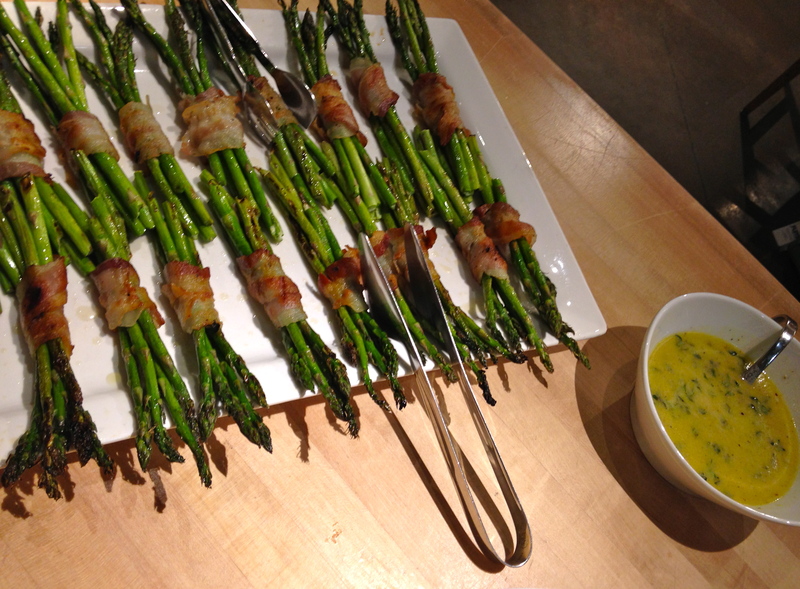 Another station was in charge of pancetta-wrapped asparagus with a lemon citronette. It was simple, but delicious! The sauce really made the dish pop with flavor. 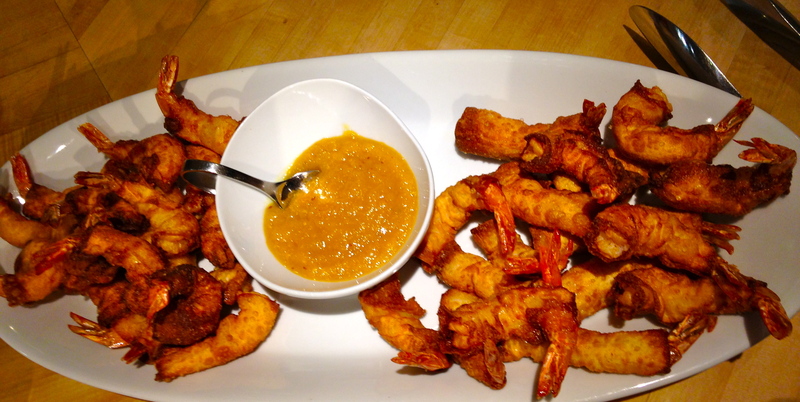 The third savory dish was crispy shrimp rolls with a mango sauce. The shrimp were wrapped in wonton wrappers and then deep-fried. They were so meaty and turned out perfectly cooked when fried this way. And the sauce was sweet and a little spicy which is a combination of flavors that I love! 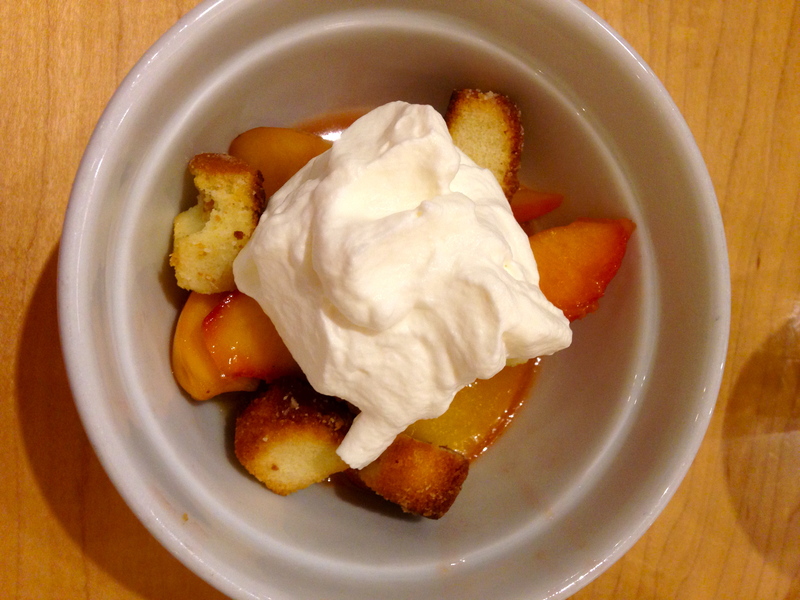 For dessert, we had bourbon nectarines with pound cake croutons. Not being much of a baker, this is a dessert recipe that I will absolutely make again! The pound cake croutons were incredible as they soaked up the bourbon sauce from the nectarines and the whipped cream. And again, it’s a perfect summer dish using fruit that is in season (this would be just as incredible with an assortment of berries, plums, strawberries, or any fruit of choice that’s in season). 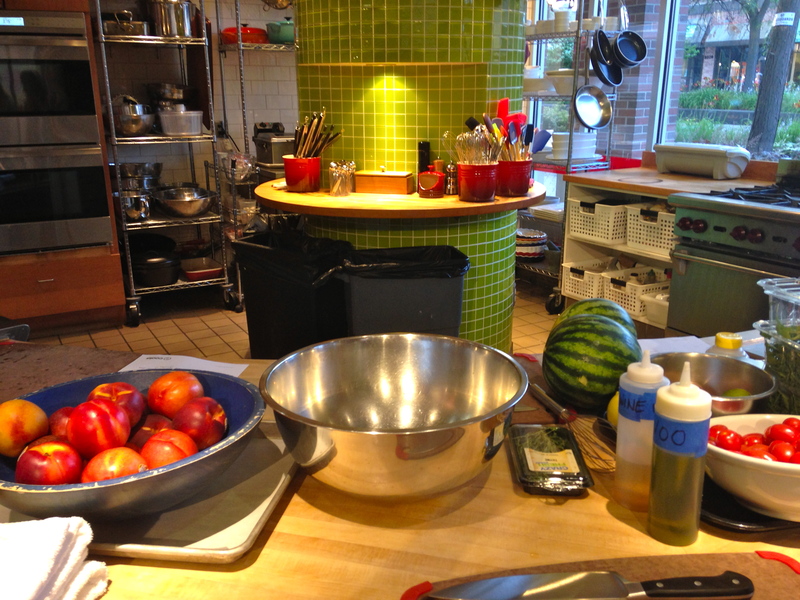 The cooking facility at Cooks of Crocus Hill was beautiful and I look forward to taking more classes here in the future! 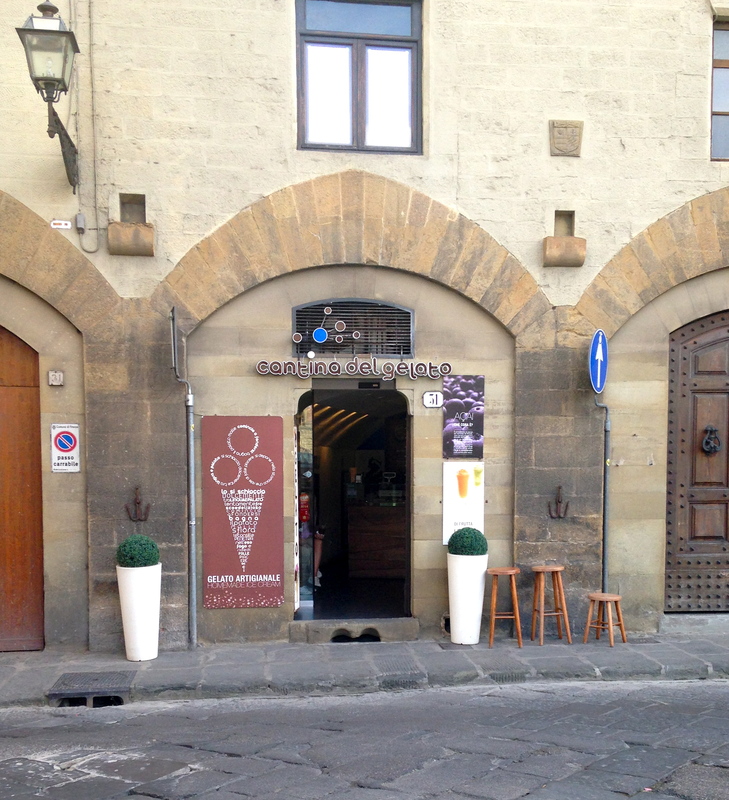 I tried a lot of gelato from countless gelaterias during our 88-day stay in Florence. It was a tough job, but I was happy to do it. 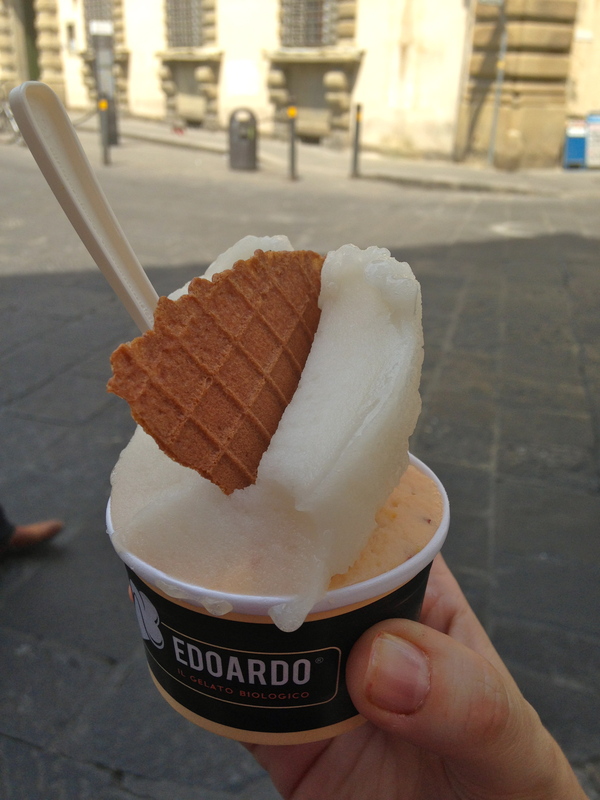 Recognizing not everyone gets that much time to explore the gelato scene in Florence, I figured people might appreciate a list of the best gelaterias, according to my opinion. 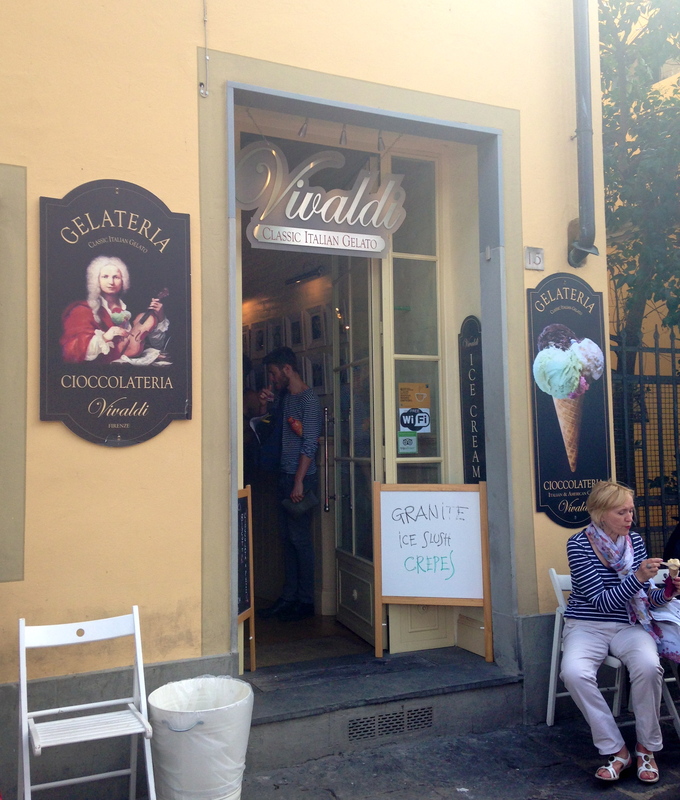 Disclaimer: I haven’t been to every single gelateria in Florence, so I can’t claim this to be a completely exclusive list. 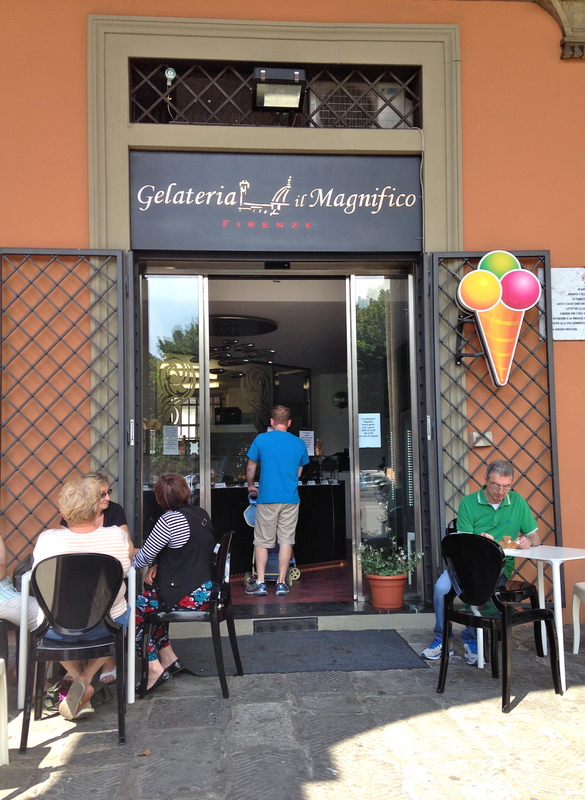 Having said that, I’ve been to many underwhelming gelaterias in Florence which are easier to find than the impressive places, so I hope this helps steer people in the right direction. And I went to each of these gelaterias more than once, so I know I didn’t just luck out with a one-off positive experience. 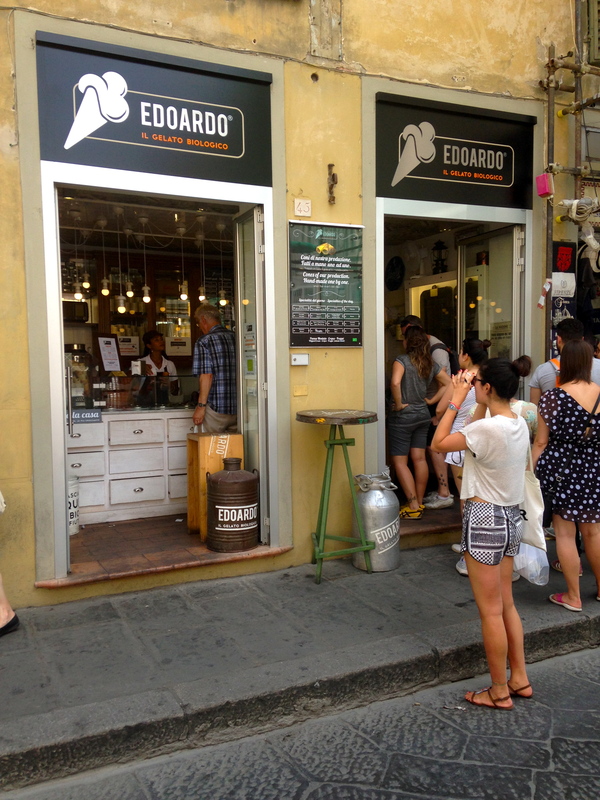 This list aside, if you’d like tips on picking a quality gelateria, see the post for Florence: Day 56. Enjoy! 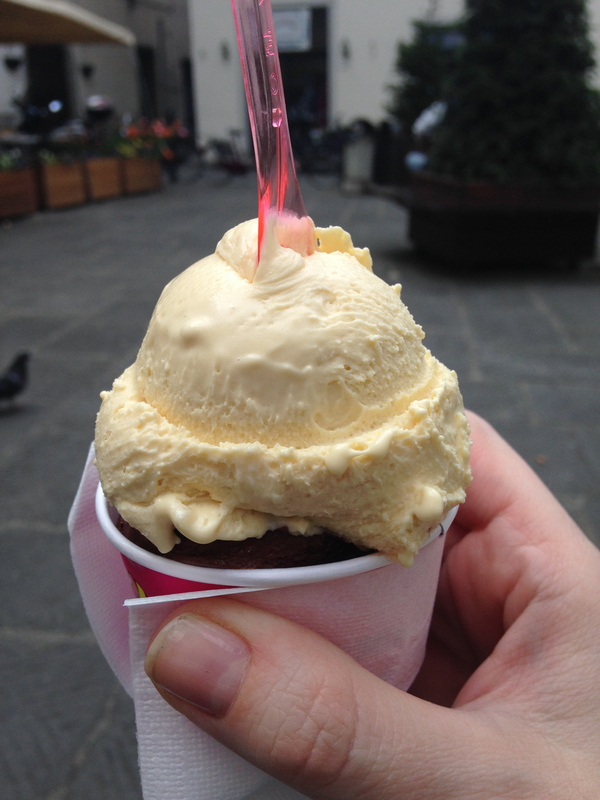 I foolishly don’t have any pictures of their gelato, but I will never forget the whiskey cinnamon flavor. It was so good I had it twice. 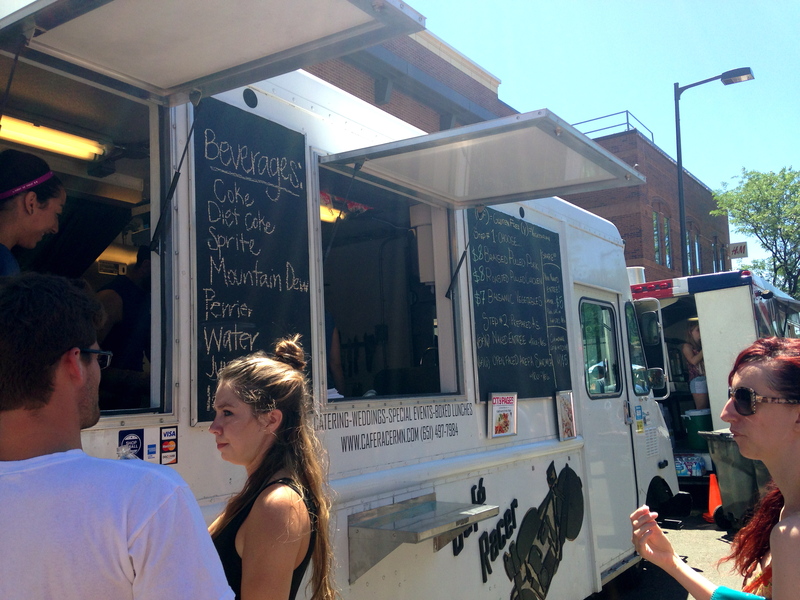 On June 29, we headed to Uptown in Minneapolis to join my brother and his fiance (Kyle & Lindsay) at the Minneapolis Food Truck Festival. It was a beautiful day to walk around and try a variety of food and we had such a great time! Luckily the whole group wanted to try a bit of everything, so we all operated on the same strategy: we decided what to get as a group and split it all four ways (well, four and a half with Emily). 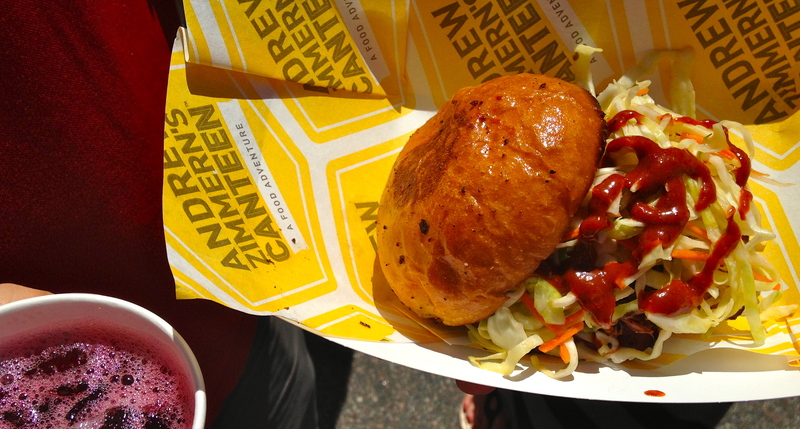 Our first stop is probably one of the best known food trucks in Minnapolis, Andrew Zimmern’s Canteen. My expectations were high for this truck with all of the hype around it and I can say, it did not disappoint! We ordered the special that they were making for the festival which was a crispy smoked meat sandwich with maple hot sauce and vinegar slaw. There was such an amazing combination of flavors going on (spicy, smoky, sweet) combined with a variety of textures (soft bun, chewy meat, crunchy slaw). It was so good! And we washed down the sandwich with a Jamaican hibiscus punch. This was most people’s favorite dish of the day (my second favorite). 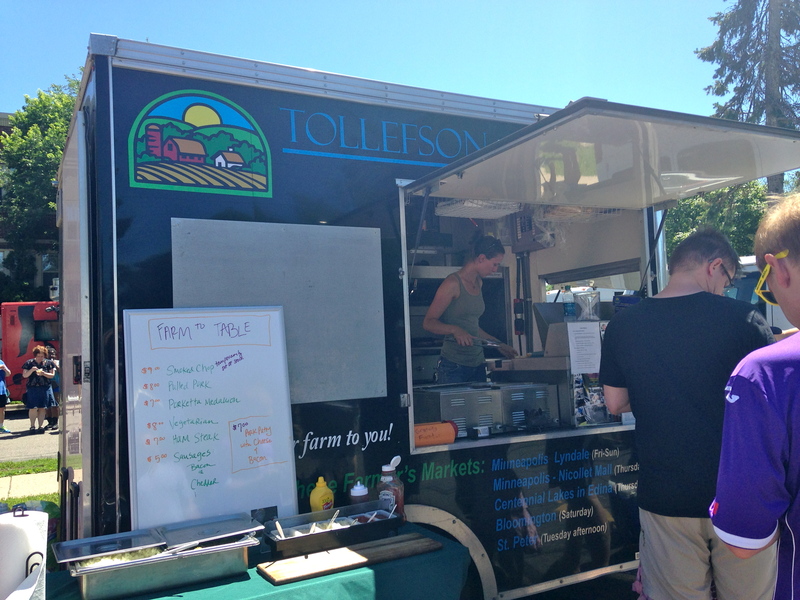 Next, we stopped at the Tollefson truck for a midwestern staple that Joe and I were both craving after being in Italy for three months: a brat! 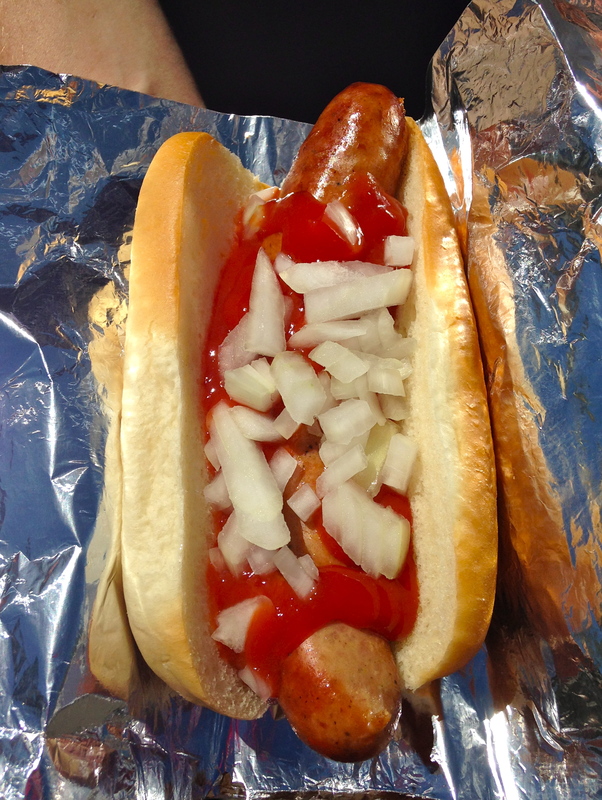 Joe took the lead on this dish and topped it with ketchup and raw onions. There was nothing terribly unique about the brat, but it was delicious and exactly the back-home comfort food Joe and I were craving. Our third stop caught our eye because they were serving arepas, a kind of cornmeal flatbread/cake that originated in South America. Kyle and Lindsay’s favorite Minneapolis food truck Hola Arepa specializes in these, but was not at the festival. 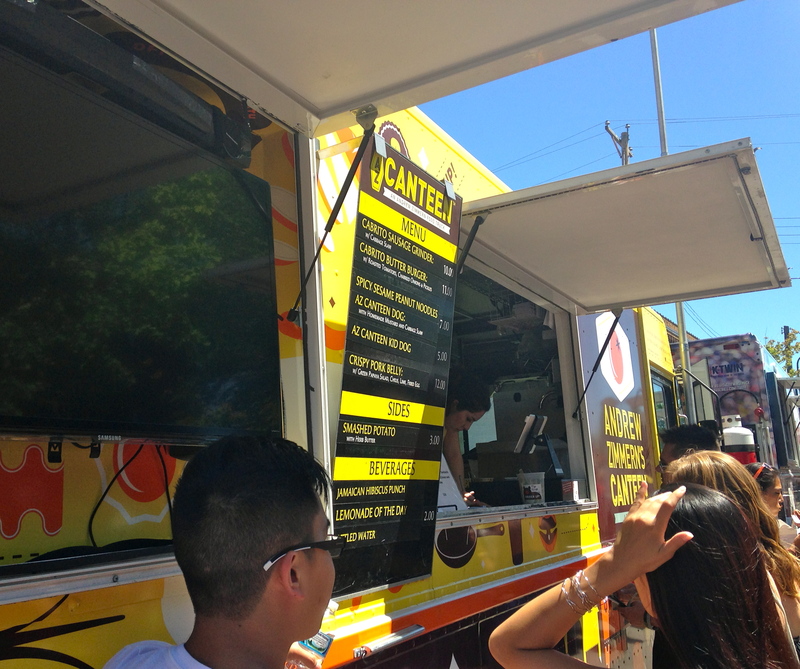 So we decided to try this truck, which was called Cafe Racer, to compare. We ordered the balsamic vegetable arepa with a side of rice. 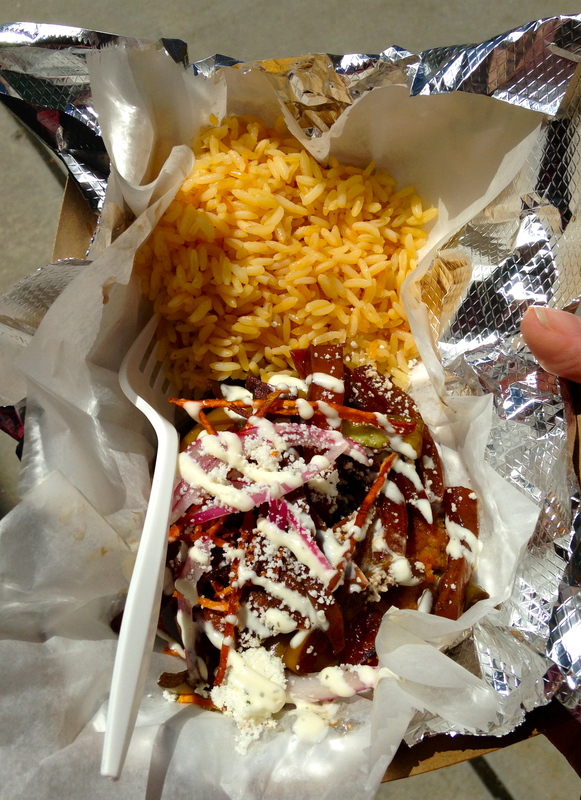 The vegetables were delicious, the arepa was a bit tougher than I like and the rice was not very notable. This was probably everyone’s least favorite dish of the day. But it was nice to have a few vegetables worked into the mix. Our fourth stop wasn’t an actual food truck, it was a tent that was put up by a cookware store/cooking school located on the street of the festival called Kitchen Window. 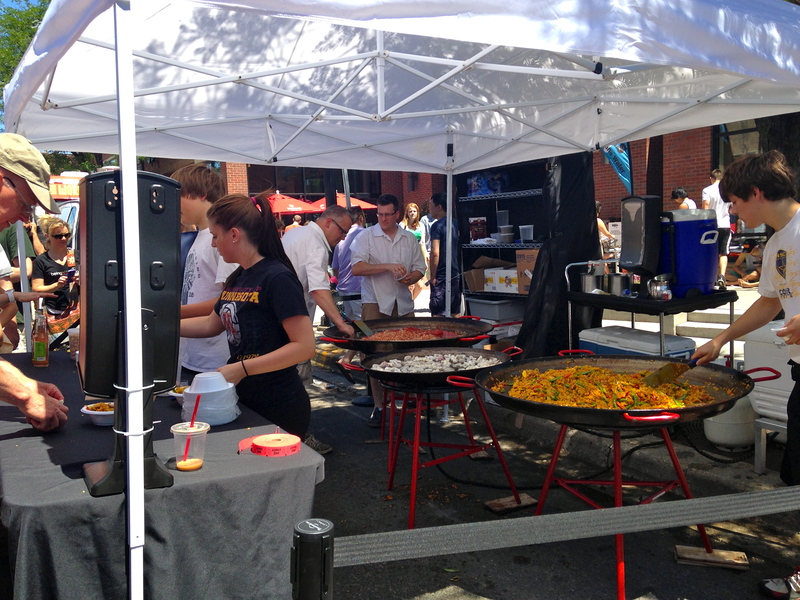 They had three massive paella pans working to cook a variety of meat, seafood, vegetables and rice and it was just too tempting to pass up. 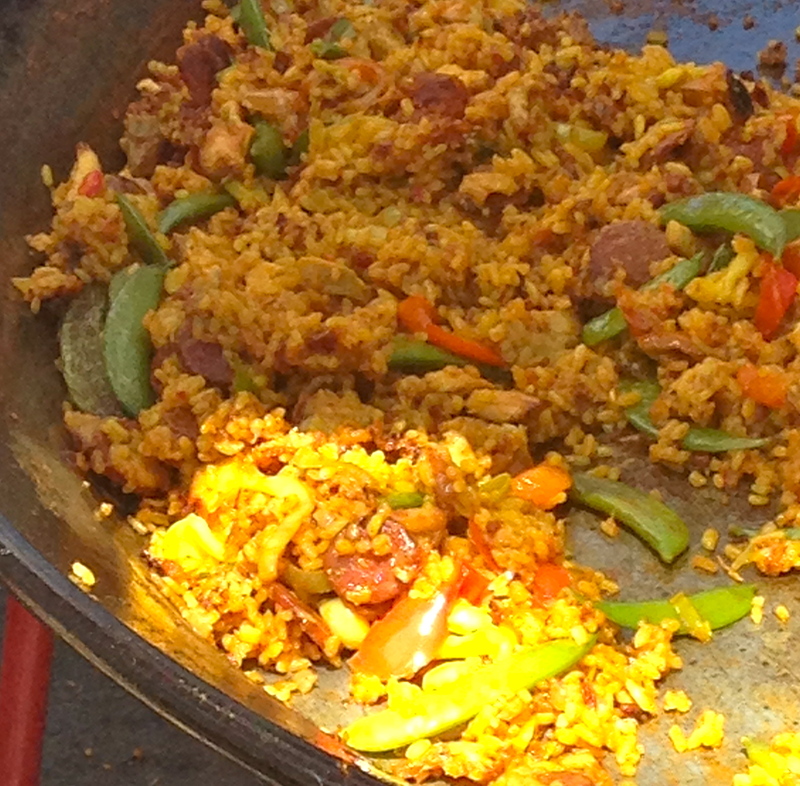 This paella was incredible! It was packed with flavor, the seafood was tender, the rice was perfectly al dente. This was my favorite dish of the day! 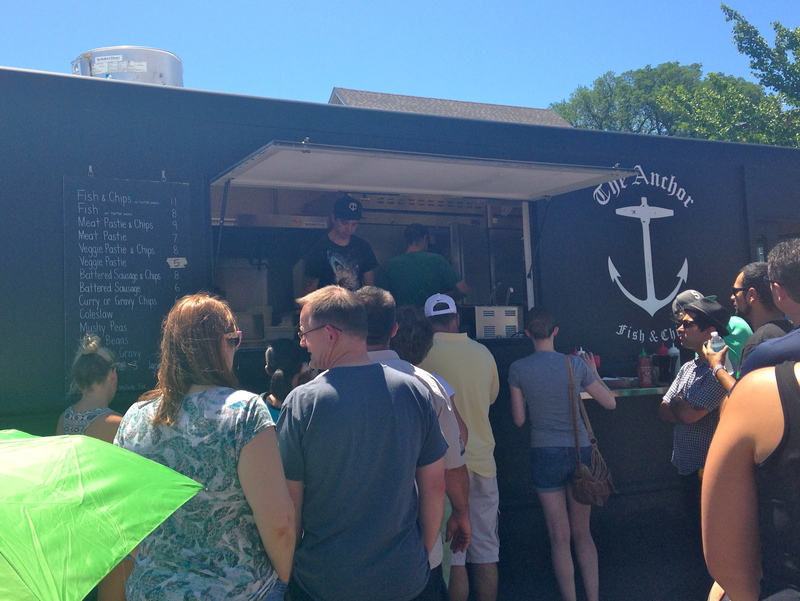 Last but not least, we tried the Anchor Fish & Chips truck. 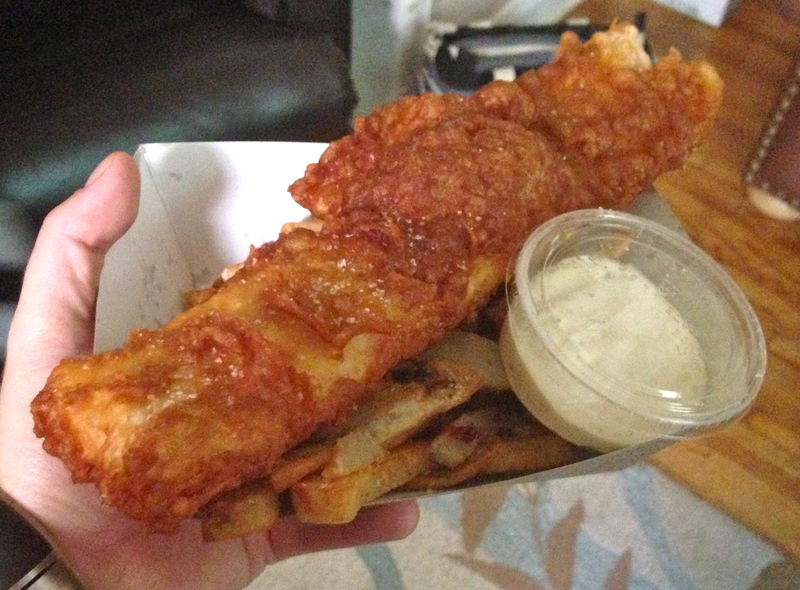 And we ordered the namesake fish and chips. The piece of fish they served us was HUGE. It was so big (and we were all getting pretty full at this point) that we couldn’t quite finish it. The fish was so tender and juicy with a delicious crispy coating. The fries were okay, but nothing outstanding. But the fish made up for the fries. Joe and I really enjoyed getting back into a city, and it was such a fun afternoon sampling a variety of food with family in such a fun setting! A few days after we returned to the states, my mom hosted a “welcome home” family BBQ. She provided ribs which we cooked on my Big Green Egg (which I am so excited to be able to start using on a regular basis!). And then each of my siblings and I were in charge of bringing a side dish to share. My mom did specifically request from me a dish that was inspired by our time in Italy. I decided to put together an antipasto platter for everyone to snack on for an appetizer. I included olives, cheese, grilled zucchini (which took on an amazing smoky flavor from the Big Green Egg), a carrot and zucchini frittata, melon and prosciutto, and roasted red peppers. 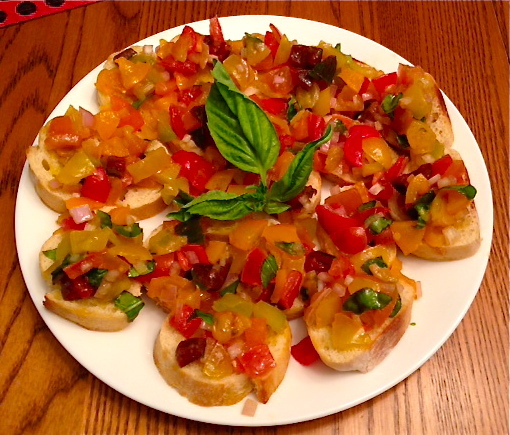 I also bought some multi-colored heirloom tomatoes which I tossed with some chopped shallots, torn basil, and Tuscan olive oil for a quick bruschetta topping. 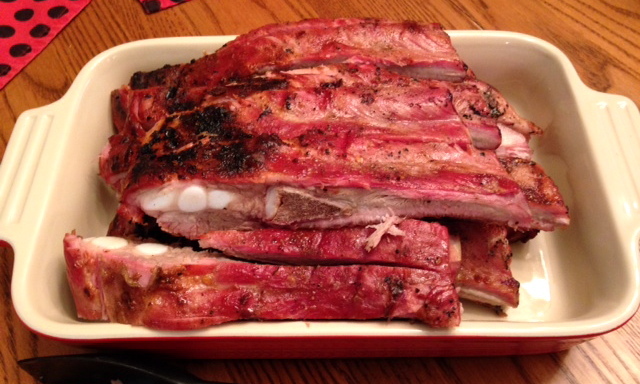 The ribs turned out beautifully smoked, and were juicy and delicious! 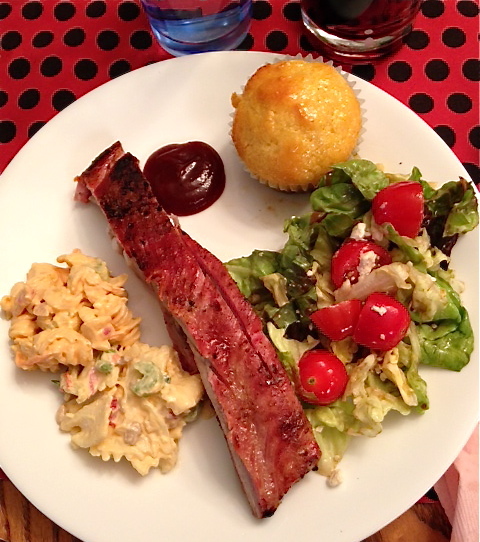 The ribs were accompanied by a couple pasta salads, a lettuce salad and cornbread muffins. It was a fabulous spread and a delicious way to be welcomed home to the US, combining some Italian and some American food favorites!